This is a small note on The BIG Rescue Bible (CEV) that I’ve bought and started reading today. After having a big breakfast (for lunch) with a mate, I went to ‘Steps’ at Liverpool, where I had acquired the very first Bible I had ever bought for myself. I bought what seemed to be their last copy of The BIG Rescue Bible and these are my thoughts after re-reading Genesis 1-11 for this test-drive. and how to read the Bible, including a breakdown of a Bible reference (e.g. Mark 1.1-3). 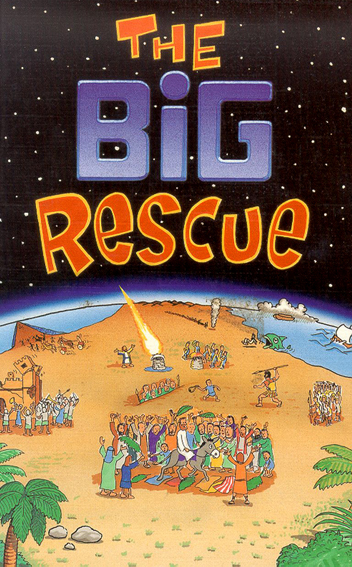 This is followed by a ‘Guess what is in The BIG Rescue’ section that allows readers to exercise their reference deciphering skills and also discover cool little stories in the Bible as well. and has sections on “Jesus and You” and “Jesus and Prayer”. And I’ve not yet seen another Bible that introduces the books so succinctly yet comprehensively, ending with a memorable verse from that book in bold italics. My favorite bit is probably the subheadings they give for parts of the text are separated in box adjacent to the text, which doesn’t confuse readers of what is and isn’t the Bible and makes it easier to scan for the parts you are looking for. And the back pages have all the information that may interest the more adult readers, as indicated by the smaller print it seems, including translation information and indexes. The translation is excellent for ease of reading. And it avoids confusion and complicated words by replacing “ark” many times with “boat”, for example. But I did find some of the substitution slightly unfortunate, as “one of hers” [3.15] replaces “offspring” (NIV) making the intentional obscurity less clear; and “supernatural beings” [6.1-2] replaces “sons of God” (NIV) making more of a direct reference to angels when Biblical Studies in high school have taught me to consider alternatives 🙂 It also avoids explaining things like the Leviathan in Job 3.8 by talking, instead, about “Those with magical powers”, which I found amusing. I was pleased overall with my new Bible. And I look forward to growing in my relationship with God by studying God’s word through this interpretation for this year. I don’t think it’s wise to give the Bible a rating since God’s word is infallible. I will, however, give 4 out of a possible 5 Patrick Stars to the Bible Society of America for their translation work and the same to the Bible Society of Australia for their publishing work of this edition. P.S. I almost forgot! There was a CD-ROM included which is also cool and interactive. Posted on November 2, 2010, in Bible and tagged Bible translation. Bookmark the permalink. Leave a comment.